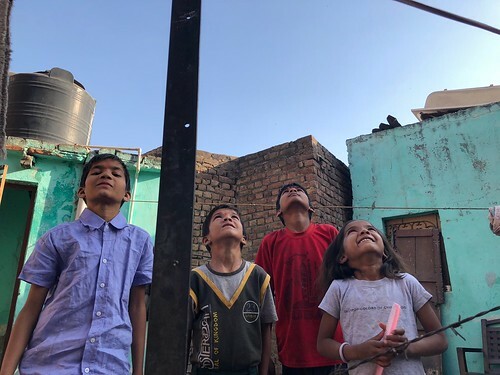 There is no Qutub Minar but Qutub Minar. 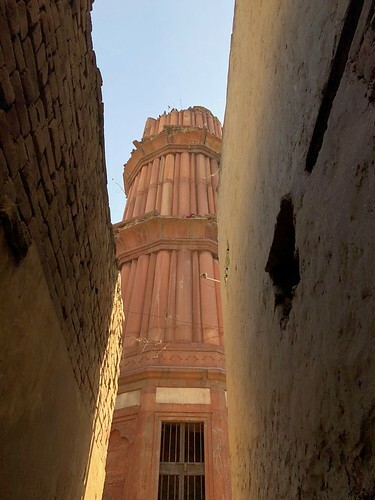 Well, there’s a second Qutub Minar in Delhi — quite far away from its world-famous namesake in Mehrauli. 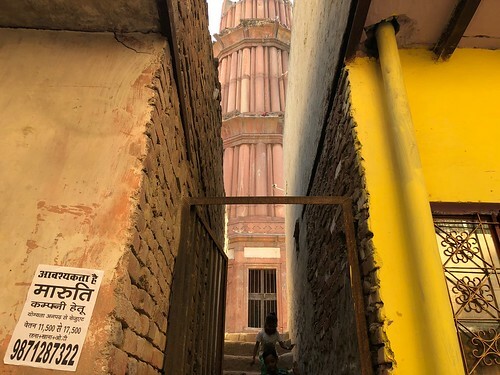 The people living in the vicinity simply call it by this name, their own hyperlocal Qutub Minar. 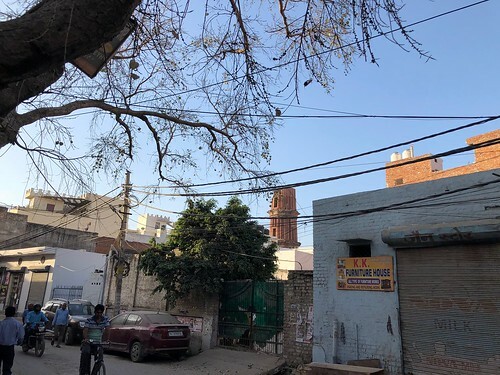 It is located in a part of the capital usually not associated with historical monuments: Hastsal, in West Delhi’s Uttam Nagar, is just another of the city’s urban villages, full of brick hovels and bylanes teeming with children and chickens. 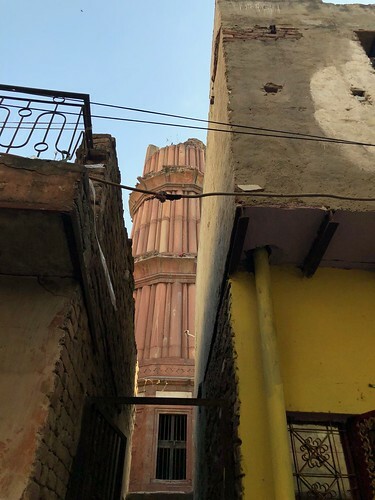 Keep walking through these ordinary streets, though, and suddenly you’ll spot the tower — or rather, before anything else, a glimpse of it through a crack between two houses. The tower is partially lopped off, or seems to be. Surrounded by improvised housing, it looks out of place and this surprising dissonance makes it look more precious. The tower was built by Emperor Shahjahan on what was supposedly, at the time, a hunting ground. 400 years later, it is impossible to imagine this crowded locality as a forest filled with animals. There is no way to go to the top. The iron gate to the stairs is locked. On looking up, we can see leafless plants creeping out of stones and birds sitting on the higher ledges. A man conspiratorially tells us that a secret tunnel underneath goes straight to the Red Fort (note: this is said of almost every Delhi monument). Some of us may mourn the tower’s abandoned state but we take consolation in its liveliness. 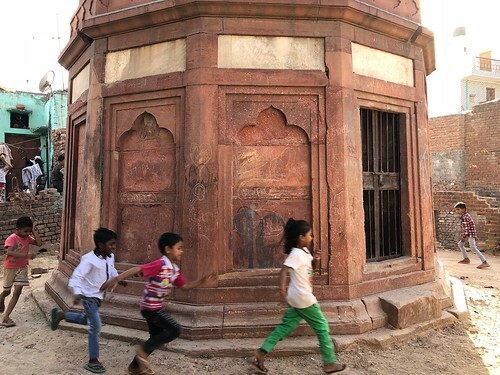 Neighborhood kids are running around it, playing chor-police (police-thief), and from the surrounding dwellings all sorts of noises are wafting: a loud conversation, the soundtrack of a daily soap opera… As for Shahjahan’s souvenir, it somehow manages to survive as the hostile city is laying siege to it on all sides.